The Kingborough Tigers Football Club currently run two weekly Bingo sessions which are open to members as well as the general public. Both sessions run for 12 months of the year (apart from Christmas closedown). The Main sessions are held at the Waterfront Hotel 4 Cambridge Road, Bellerive every Tuesday morning commencing at 10.45AM. Please refer attached information brochure for detailed information. 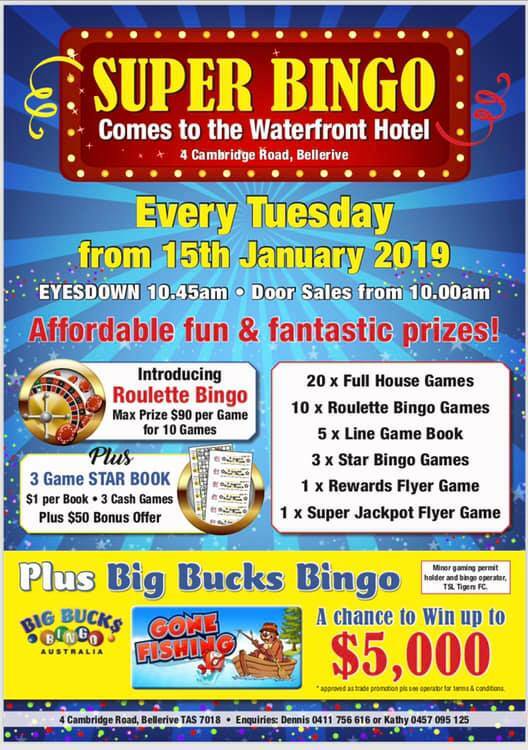 The Bingo format involves new and exciting promotions and prizes aimed at making the sessions different from other bingo sessions (all as information flyer). Players will also have access to Rewards Club and associated member benefits. We also run Bingo every Wednesday evening commencing at 7.00pm. This is held in the Main Function Centre at the Twin Ovals Kingston where we offer modern facilities, computerised equipment and kiosk facilities. Our Bingo sessions are run by a dedicated group of volunteers who also get involved in gate raffles and other fundraisers so on throughout the year. These activities provide valuable funds towards the running of the club which is fast growing into a Community Sporting body that covers various activities such as, Junior Footy (both girls and boys), Senior and Reserve teams in the Statewide League, Women’s Footy, Netball teams and continues to expand. Should you be a position to assist, both the club our current volunteers would be most grateful. We cordially invite you and yours to “jump on board this Tiger Train” and enjoy the journey! !